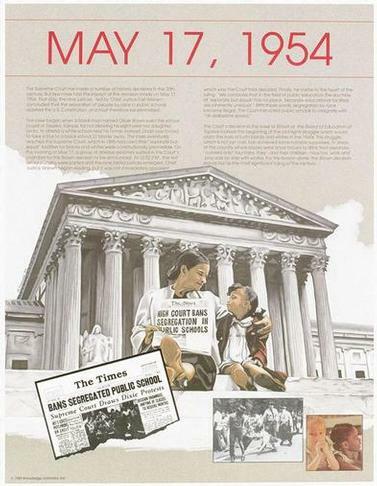 May 17, 2004 marks the 50th anniversary of Brown v. Board of Education, the most important ruling of the Supreme Court in the 20th Century. Declaring racially segregated schools as inherently unequal, the Court signaled a reversal of judicial support for apartheid, deeply rooted in America�s colonial foundation and elevated as national doctrine in the abominable �separate but equal� opinion of 1896. Brown�s repudiation of Plessy v. Ferguson was seismic. Much more than an historical and constitutional watershed, the 1954 decision was a cultural shift that challenged habits, customs, traditions and way of life, North and South. Just as significantly, it helped to invigorate a century-old civil rights movement and to make progress beyond the schools--in housing, voting, transportation and public accommodations. By the end of the 20th Century, however, the nation appeared to have second thoughts about Brown. Racist opposition to African American progress and the resurgence of conservatism in all branches of government barricaded the road to desegregation. Justices with leanings closer to Plessy than to the Warren Court largely turned their backs on the spirit of Brown. In this program, we will study the historical backdrop of Brown, the legal battle leading up to it, and its 50-year aftermath. Credit awarded in: African American studies, constitutional law, racism and the law, sociology, critical reasoning, and writing. Program is preparatory for careers and future studies in ethnic studies, political science, public policy, law, social justice and advocacy organizing, teaching.